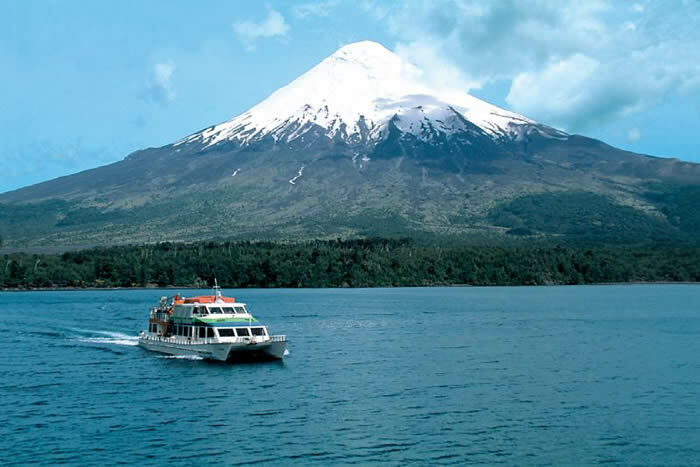 Departure is in the morning for this all-day tour to the Lake District around Puerto Varas. The journey follows the shore road along Lake Llanquihue, from which there are beautiful views towards the Osorno and Calbuco volcanoes. First stop of the day is at the ‘Saltos de Petrohue’: a collection of rapids and waterfalls that dance over impressive rock formations in the petrified lava from the surrounding volcanoes. It is the waters of the Petrohue River itself that have eroded and shaped these rocks over a period of thousands of years. 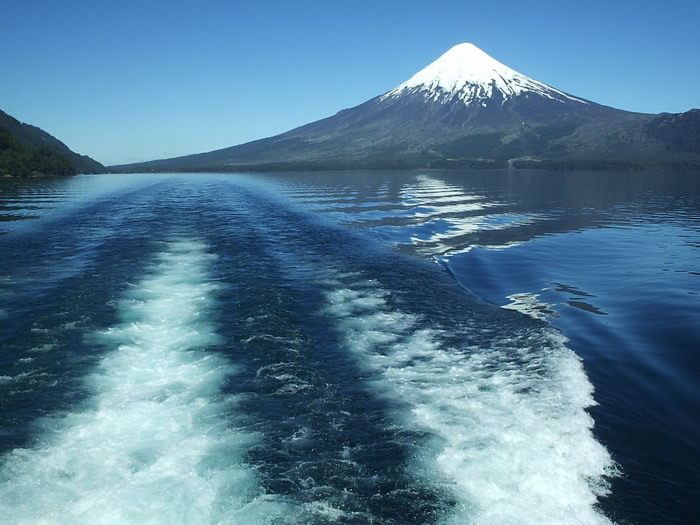 You will go on a two-hour boot trip across the Todos los Santos Lake setting off from the jetty by Petrohue. This ‘All Saints” lake is embraced by high, densely forested mountains, while the wider picture is dominated by the perfect cone of the Osorno volcano. During the journey, small islands and waterfalls are passed, as well as the Puntiagudo volcano, which reaches steeply for the sky. Your destination is Puella, set in the heart of the Vicente Perez Rosales National Park. Here you can set off on a hike through the dense Valdivian temperate rainforest to reach the ‘Cascada de la Novia’ (Bride’s Waterfall), and there is also a chance to become acquainted with many indigenous trees and plants on an interesting educational footpath. During the late afternoon you will return to Petrohue, where the journey back to Puerto Varas is completed by bus or car.